Turning cold over the next few hours across PEI..
Monday, January 21st 6:40am.. A storm system moved NE along the US mid Atlantic coast yesterday and moved into the Maritimes overnight. The storm center is now located near Truro, NS and will continue to move NE crossing PEI over the next few hours before moving into the Gulf. Snow changed over to rain as the associated warm front moved across the yesterday evening. The associated cold front will now sweep across the island before over the next couple hours which will usher in much colder air resulting in a rapid freezing of water/wet/slushie surfaces on brisk W-NW winds. Cloud and flurries will continue into tomorrow especially eastern PEI in the onshore NW flow off open water. A ridge of high pressure will crest over the island on Wednesday morning then move east. Interesting set-up on Wednesday as a couple of low pressure systems approach. 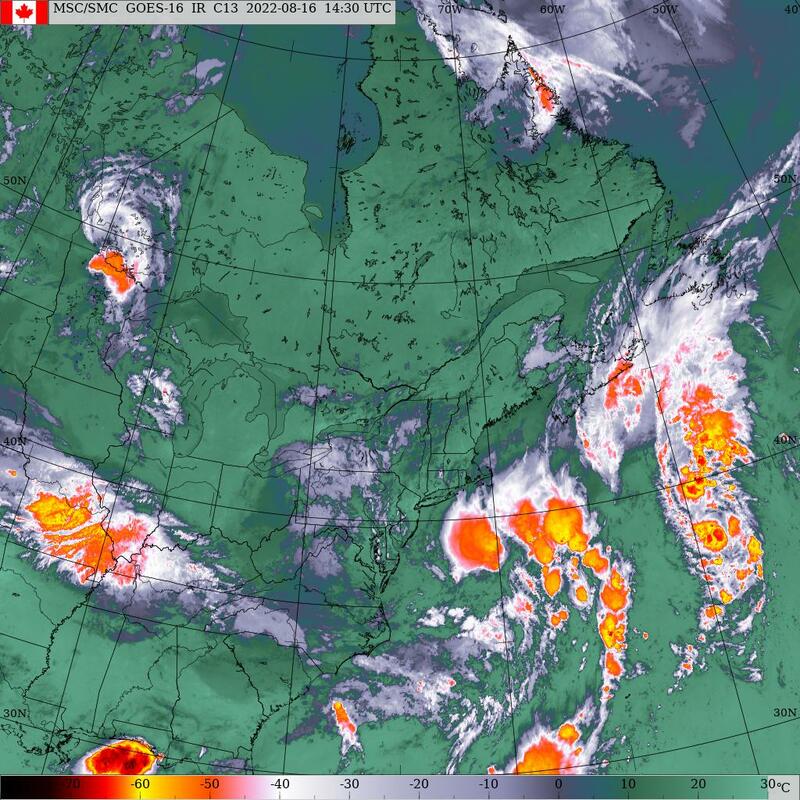 These systems, one from the great Lakes and a the second from the US mid Atlantic coast will merge Thursday morning near Cape Cod and move NE across the Maritimes. Precipitation will start out as snow Wednesday afternoon as the Great Lakes low approaches but will change over to rain by early evening as warmer air gets involved. Rain continues into Thursday morning as the second takes over and approaches. This 2nd system now the primary storm system moves NE across the Maritmes Thursday evening with the associated cold frontal passage occurring by dawn Friday morning as the storms pulls away into the Gulf. High pressure should then dominate into the weekend. Precipitation.. Snow changed over to rain yesterday around suppertime in Charlottetown area with about 10 cms recorded. Any left over showers will change back to flurries this morning as the colder air returns. Flurries will continue through tomorrow in the onshore NW winds. Snow begins again late Wednesday afternoon changing to rain by mid/late evening. The rain then becomes heavy ion Thursday as the coastal storm approaches ending Friday morning. Flurries on Saturday. Temperatures.. Will now fall quickly with the passage of the cold front over the next couple hours. Cold tomorrow then a warm-up on Wednesday and stays mild through Saturday afternoon. Wind.. Winds will shift to the NW over the next hours or so marking the passage of thew storm and cold front. Brisk NW winds tomorrow diminishing to calm Tuesday night then southerlies develop on Wednesday. Hazards.. Water/wet/slushie surfaces will freeze quickly over the next couple hours as temps plummet. Watches/warnings.. Flash freeze warning in effect. Today.. Cloudy with showers changing to flurries over the next hour or so, light-brisk NW winds, temps falling quickly to -8 by noon then steady. Wednesday.. Snow developing mid afternoon changing to rain by evening, light south winds, temps -6 at noon rising to +1 by midnight.